Residents of San Jose del Golfo and San Pedro Ayampuc, about an hour north of Guatemala City, have been steadfast in their rejection of a gold mine in the region. They are concerned about the mine’s health, social and environmental impacts, which will last for generations to come — so much so that one woman’s spontaneous act of civil disobedience quickly grew into a community-based, peaceful resistance movement. Men, women and children, in shifts, have spent 24 hours a day, seven days a week, for over 10 months, blocking the entrance to the proposed mine. Organizers of the campaign that has come to be known as Communities in Resistance maintain that the government has not complied with legal obligations to consult with communities about projects that would affect them. Residents also say they weren’t given the opportunity to read and submit comments on the mining company’s environmental impact assessment. At the same time, a series of attacks against community leaders — some with deadly intent — have not been fully investigated. The mining project, first owned by the Canadian company Radius Gold and later sold to the U.S. engineering firm Kappes, Cassiday & Associates (KCA), has received a dozen mining licenses for exploration and extraction covering an area of nearly 5,000 acres. The company expects to process approximately 150 tons of material per day from at least three separate extraction sites, using both open pit and tunnel mining. In an already dry region, where families sometimes have access to fresh water only twice a week, the mine would use over 40,000 gallons of water per day. KCA’s own environmental impact assessment recognizes that air quality would be affected, as well as flora, fauna, topsoil and the available quantity of water. It would permanently alter the subsoil and the possibility of future farming. While KCA has committed to extract the gold using a technique called flotation — which poses less risk than the common practice of using cyanide — it is unclear where the company plans to treat or dispose of chemical tailings and what impact this will have on the local water and soil. After the company acquired the land in 2000, almost a decade passed while experts tested different locations for gold — all without the local communities’ knowledge. Residents noticed strangers coming and going, sometimes loading rocks and soil into pickup trucks, but didn’t think much of it. When they discovered — through a newspaper article in 2010 — that it was a mining operation that would affect at least a dozen communities and thousands of families, many were outraged. Residents attempted to get information from different government agencies but were given the run-around — if not directly lied to — about the status and particulars of the mining project. 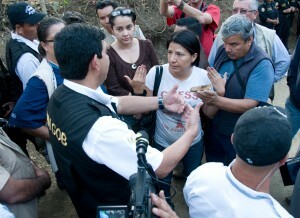 On March 1, 2011, Estela Reyes had had enough of the mining vehicles. She parked her car in their path and refused to move. 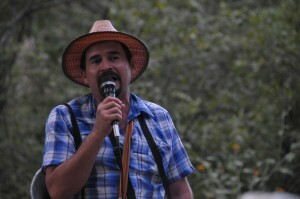 The next day, Reyes was joined by more community members, who placed themselves in front of the gated entrance to the mine. It was the beginning of Communities in Resistance, or the Puya, as the human blockade has since come to be known. As community members settled into their shifts, the roadblock became a routine. Some donated food, others volunteered their time cooking; some came for 12-hour shifts, others stopped by after work. Over time, more tents appeared and an increasing number of solidarity banners were hung, creating a sense of enclosure and permanency at the small encampment by the side of a dirt road. 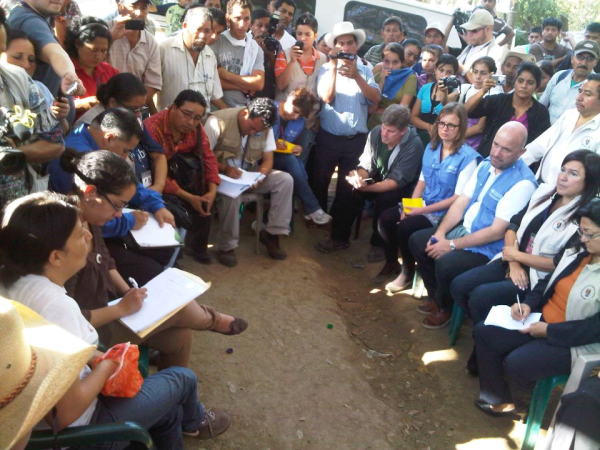 Over the last 10 months, the communities have received numerous delegations, including three with my organization, the Guatemala Human Rights Commission (GHRC), as well as other national and international solidarity visits. They have held concerts at the roadblock, hosted speakers and organized press conferences. As early as mid-2011, those who stood out as community leaders began to receive telephone threats and intimidating comments. One man came home to find his fish poisoned, another his chickens. Although they reported these incidents to the authorities, the government did nothing. Then, on May 8, 2012, those on the night shift at the Puya saw a mass of vehicles approaching in the darkness. 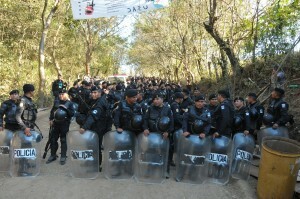 An estimated 300 riot police in 50 trucks accompanied mining vehicles and heavy machinery. Residents acted quickly, calling friends and family, who descended on the blockade. The local priest, not known for his activism, rang the church bell. Hundreds stood silently in front of the police and machinery, denying them passage. Their plan foiled, the police and mining vehicles ultimately turned around. Peace didn’t last long, however. On June 13, community leader Yolanda Oquelí was ambushed by two men on motorcycles just as she was leaving her shift at the Puya. Oquelí was shot at repeatedly, with one bullet striking near her spine. Though she survived, doctors were unable to remove the bullet and she continues to experience almost constant pain. Oquelí, a mother of two young children, had been involved in the movement since the beginning and speaks passionately about the communities’ deep commitment to nonviolent resistance. She became an important voice of the movement, and by June she and her husband had already received numerous threats. In fact, just days before the almost-fatal shooting, she had presented a formal complaint to the public prosecutor’s office expressing concern for her safety and requesting an investigation. Although she was granted precautionary measures by the Inter-American Commission on Human Rights months later, the attack has still not been fully investigated and no one has been held accountable. As hundreds participated in the community forum, the Guatemalan mining subsidiary of KCA, EXMINGUA, had organized a loud party across the street with live music and free T-shirts that read “EXMINGUA – Minería Responsable” (EXMINGUA – Responsible Mining). Although the gathering attracted few participants and did not succeed in disrupting the speakers at the forum, it was nevertheless a sign that the company was going on the offensive. Tensions came to a head in November as the mining license reached the one-year mark with no actual mine to show for it. On the morning of November 13, approximately 80 people from San Jose del Golfo and surrounding municipalities wearing EXMINGUA hard hats and shirts tried to force their way into the mine. They were unarmed, but they threatened and intimidated those at the roadblock. 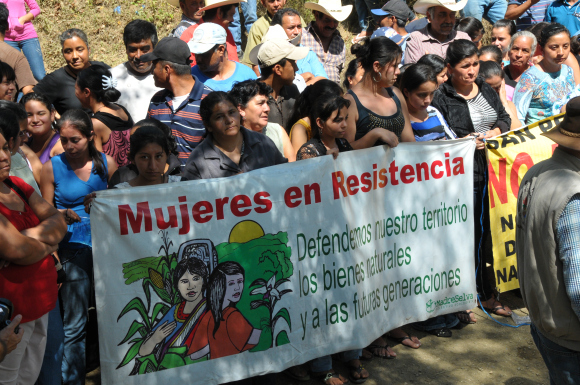 As news spread about the confrontation, the number of those in peaceful resistance against the mine grew to an estimated 500 people. About 16 members of the National Civil Police were also on the scene but held their distance. Attempts at dialogue facilitated by representatives of Guatemalan and international organizations failed. This pattern repeated almost daily for three weeks, with escalating insults and threats of violence hurled at the peaceful protesters. Then, on December 7, the government declared that it would be evicting the Puya. Although a legal eviction order was never produced, anti-riot police arrived at the roadblock and began tearing down the banners and other installations. They also arrested at least five people (who were later released) for allegedly obstructing the road — a charge disputed by the protesters. Police shot tear gas into the crowd, which included men, women and children of all ages. Several people, including two young girls, were treated for tear-gas exposure. The police also tore apart the makeshift kitchen. None of this stopped the peaceful protesters from holding their ground. They lay down on the unpaved street with cloth masks covering their faces and sang hymns to give themselves courage. By the end of the day, a tenuous agreement had been reached: Eight police would remain at the gate to the mine with the protesters, and the government would initiate a formal dialogue process the following week. While communities across Guatemala resist similar projects — gold mines, nickel mines, hydroelectric dams, among others — few have so successfully halted a project in its tracks. In a country where disputes often escalate into violence, the enduring nonviolent community resistance in San Jose and San Pedro has earned a great deal of support from the international community. In the midst of the November confrontations, GHRC invited Oquelí to speak at the SOA Watch Vigil — an annual protest to close the School of the Americas in Fort Benning, Ga. For Guatemalans, this is a place of great significance since many SOA graduates assisted the country’s three brutal military dictatorships from 1978 to 1986. Even current president Otto Pérez Molina is an SOA graduate. Kathryn Johnson and Rob Mercatante of the Guatemala Human Rights Commission also contributed to this article. Kelsey Alford-Jones is the Director of the Guatemala Human Rights Commission in Washington, D.C., a solidarity organization founded in 1983. Kelsey monitors human rights violations in Guatemala, raises awareness in the international community and advocates for policies in Guatemala and the U,S. that promote peace and justice. Kelsey travels frequently to Guatemala to meet directly with community leaders and human rights organizations. Thanks Kelsey for a very inspirational article. WHERE CAN I CONTRIBUTE TO THIS CAUSE? Thank you for your question and your interest. You can learn more about GHRC and this cause in particular at http://www.ghrc-usa.org. To contribute financially to this cause you can go to https://npo.justgive.org/nonprofits/donate.jsp?ein=52-1295497. Nice post. I discover something even more challenging on unique blogs everyday. It’s going to constantly be stimulating to read content from other writers and practice just a little some thing from their store. I’d prefer to use some using the content on my blog regardless of whether you do not mind. Natually I’ll provide you with a link on your web blog. Thanks for sharing.